The Spartans were supposed to be pretty good this year, but they are getting some #1 buzz and currently rank 6th in KenPom. 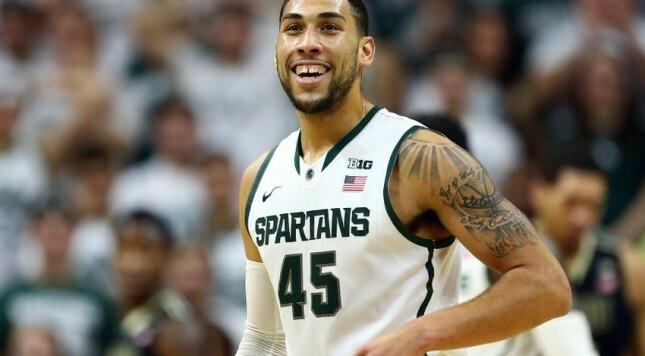 Denzel Valentine looks like the early player of the year favorite and is almost averaging a triple double. Elsewhere, Michigan State is leading the country in defensive rebounding and assisting on 79 percent of its made field goals, which is 2nd in America. The Spartans have given a ton of minutes to their bench, but are an injury to Valentine away from being in huge trouble. I also think they need to get better at the point guard spot (other than Valentine), as Lourawls Nairn has struggled so far this season. When 5 star recruit Caleb Swanigan committed, I think most people were optimistic about the Boilers, but I don’t think anyone saw them ranking 7th in KenPom at almost any time in the season. Purdue ranks 2nd in 2-point percentage allowed, and has ran through it’s (admittedly not great) schedule so far. 7-footer Isaac Haas might be the Big 10 player of the year favorite if Valentine didn’t exist, as he is shooting over 75 percent this season and is one of the nation’s top rebounders. Purdue could stand to get it in to him more often, as the Boilers are attempting nearly 44 percent of their shots from deep. A loss to Northeastern took the shine off the Hurricanes a bit, but Miami still has wins over Utah and Butler so far this season, and have the second best offense in the country. Miami hasn’t come close to scoring under a point per possession this season, with its worst effort coming in its loss to Northeastern, as the Canes still managed 1.15 points per possession. The Hurricanes are led by a couple of former Big 12 players, with Sheldon McClellan (formerly of Texas) shooting 71 percent from two and 50 percent from three, and Angel Rodriguez (formerly of Kansas State) posting a 52 percent effective field goal percentage and 27 percent assist rate. Miami still gets Florida and Ivy contenders Princeton in an attempt to build its at-large resume. The Orange didn’t do much last season, and with the cloud of sanctions hanging over the program, I had kind of written them off for this year as well. However, here they are at 6-0 with a KenPom rank of 26. The Orange are led by Michael Gibinje, who is shooting 55 percent from two and almost being outpaced by his shooting percentage on threes (51.3 percent). He also has a 29 percent assist rate, is playing tough defense, and looks like an ACC player of the year contender and someone to keep an eye on for All-American purposes. Syracuse just knocked off UConn and Texas A&M, two teams who are better than you think, to win the Battle 4 Atlantis, and looks like it could do some damage in the ACC. The Trojans are ranked 51st in KenPom, quite a bit lower than anyone else on this list, but finished last season at 152 and the year before at 163, so this type of start is definitely unexpected. USC grabbed a win over Wichita State in Orlando and also has a home win over New Mexico to start the season. Back to back losses to Xavier and Monmouth have taken the shine off a bit, but with a pretty young team, there are hopes that the Trojans can build on this season and challenge for an NCAA tournament bid next year in what could be a make or break year for Andy Enfield. Fred Van Vleet has been injured, and Wichita State doesn’t have Kansas transfer Conner Frankamp yet, but the Shockers aren’t a good team right now. Four losses in a row to D1 competition and upcoming games against St. Louis, UNLV, and Utah put Wichita State in a situation where a Missouri Valley Conference tournament title might be necessary just for an NCAA tournament bid, and any type of good seed is out the door. If Van Vleet can get back to full strength and Anton Grady can get healthy the Shockers will have the talent to make a run to the Sweet 16, but right now it looks like a disappointing way for Van Vleet and Ron Baker to end their careers. The Buckeyes lost D’Angelo Russell from last season’s team and didn’t really have a replacement, so 2015-16 was always going to be a tough one, but this is a whole other situation. Ohio State lost back to back games to UT Arlington and Louisiana Tech before losing to Memphis in Miami. With Virginia, UConn, and Kentucky on the nonconference slate, the Buckeyes still have a chance to grab a signature nonconference win, but the odds are against them winning any one of those. The Hoosiers rank 7th in offense, 7th in 3-point shooting, and 4th in 2-point shooting. However, their defense is an absolute disaster. Indiana lost to Wake Forest in Maui, barely beat a horrible St. John’s team in Maui, and then lost to UNLV in the 5th place game. Yogi Ferrell and James Blackmon are one of the better 1-2 offensive punches in America, but if Indiana keeps being unable to stop any remotely quality opponent, it’s going to be another disappointing year in Bloomington. I didn’t think Texas would be a great team this season, and picked them 6th in the Big 12, but I did think they could potentially make an NCAA tournament. The Horns responded by starting 2-3 with losses to Washington, Texas A&M, and Michigan. It is worth noting that the Horns have played just one game at home thus far, and with five games at home upcoming, they have a chance to get things rolling before the Big 12 season starts. Like Texas, I didn’t come into the season with incredibly high hopes for the Illini, but they have been downright awful. Illinois lost to North Florida and UT Chattanooga, and has narrow victories over North Dakota State and Chicago State, who is ranked 335th in KenPom and the Illini needed a buzzer beater to win. John Groce went to the NCAA tournament his first season in Champaign but has not gone back since, and with the Illini regressing each season under his tenure (in the Pomeroy ratings anyway) his seat must be getting awfully warm.